Are you interested in building and programming robots? With robotics you can design, build, and program a robot to do almost anything you can imagine! If you'd like to learn more about robotics, we've got resources to explore this technology at home and in the community. At the library, you can attend a class to learn more about robotics with LEGO Mindstorms robot kits. Library staff will help you learn more about building a simple robot with LEGO and programming it to perform different tasks. Make Magazine: Provides news, interesting stories, and project ideas for robotics and other maker activities. Future Learn Begin Robotics: Explore the history, anatomy, and intelligence of robots with this free online course. If robotics interests you, consider learning more at school or even pursuing a career. 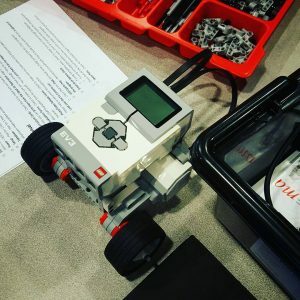 If you're in middle school or high school, look for elective classes like Robotics, Computer Programming or Computer Science, Electronics, or Engineering Technology. You will also need a strong background in math and science, especially physics and calculus. Consider college programs or majors in Robotics Engineering, Mechanical Engineering, Electrical Engineering, or Computer Science. Kids ages 6-18 can also participate in a FIRST Robotics League through their school or local community group. These after school programs teach students more about robotics through team-based competitions and creative challenges. Find local teams or start your own through FIRST Washington.